Riddle me this: what doesn't taste better on a stick? While you ponder that epic question, let me introduce you to a pint-sized pop of flavor guaranteed to delight your dining companions this Thanksgiving: the Pumpkin Pie Pop. 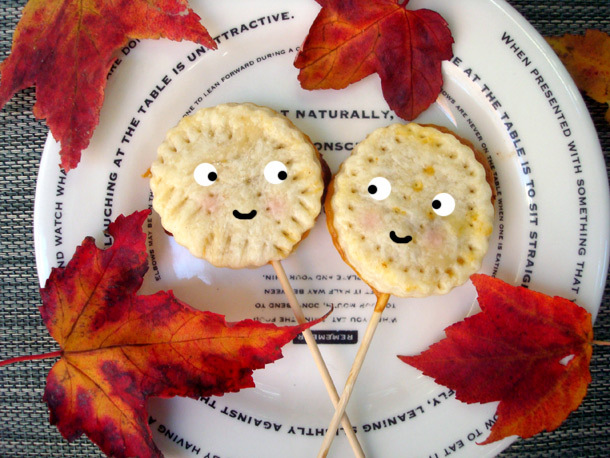 A sweet way to serve the classic autumn treat, these pops are ideal for crust lovers, providing a high crust-to-filling ratio. This also allows you to go a little sweeter with the filling: I substituted sweetened condensed milk for the more-frequently used evaporated milk in my batch, which provided a deliciously rich, caramelly-tasting filling as a result. View the full tutorial and recipe over at Serious Eats!